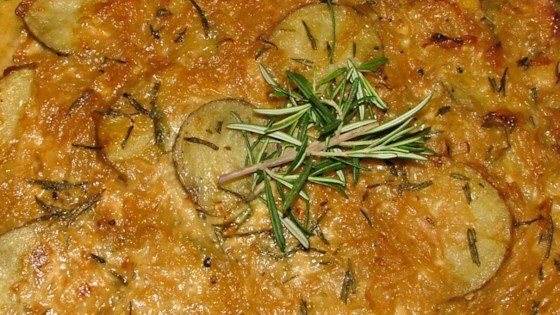 "A gourmet twist on Potatoes Au Gratin with caramelized onions and fresh herbs. Great for brunches and potlucks." Place onion, butter and brown sugar into a large skillet over low heat. Cook, stirring occasionally, until the onions have caramelized, about 45 minutes. Preheat the oven to 350 degrees F (175 degrees C). Coat a 9x13 inch baking dish with cooking spray. Place a single layer of potato slices in the bottom of the prepared baking dish. Cover with a thin layer of onions. Drizzle some of the cream, and sprinkle some of the rosemary over the layer. Repeat layers four times ending with onions, cream and rosemary. Bake for 1 hour in the preheated oven, or until top potatoes are golden brown and sauce is bubbling. This is a good, but high calorie, sidedish recipe. I would make it again, but not very often. We really liked this twist on potatoes. I used red and it made it way to sweet. I would definitly use the potato suggested and a little less sugar in the onion mixture. Liked the flavor alot.